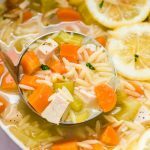 Warm up with our hearty Lemon Chicken Orzo Soup! Ladle up a bowl full of comfort in just 30 minutes using Swanson® Broth. Drizzle a little oil into a pot and then add in onions, celery, and carrots. Cook on medium heat for about 3-5 minutes. Once the vegetables are tender add in the chicken, herbs, and Swanson® Chicken Broth. Cover the soup and let it come to a boil, about 10-15 minutes. Use a spoon to remove the herbs and then pour in the orzo pasta and lemon zest. Cook the soup until pasta is fully cooked, about 7 minutes. Pour in the lemon juice and sprinkle with some fresh chopped parsley.